A: The event takes place on Stonehenge Private Reserve in the Tankwa Karoo, in Northern Cape Province of South Africa. It doesn’t take place in the Tankwa Karoo National Park (that’s an adjoining property quite far from the event site). Q: Is it the same as Burning Man? A: AfrikaBurn is a regional event of Burning Man, but is not owned or organisationally managed by Burning Man. Culturally and creatively, it reflects much of the community spirit, art, expression and creativity that Burning Man and Burner culture in general are known for. Whilst similar to Burning Man, by virtue of being in South Africa, it’s also different in many ways. A: Very few. In the spirit of radical self reliance, basic infrastructure in the form of toilets, roads, signage, medics, health and safety officers and an airstrip are provided. All other requirements are created by the participants themselves. Q: Can I bring pets or animals? A: No pets are allowed, due to the extreme environment and in the interests of maintaining the biological integrity of the site. The only exception to this would be guide dogs for the blind. Q: Do I have to get dressed up, create art and participate? A: Whatever form your participation takes is up to you. The important thing to remember is that AfrikaBurn is created by active participation – and that can take any form. Q: Can I organise a large group, buy tickets and sell a package tour? A: Nope. Resales of tickets for profit is also discouraged. Q: Is AfrikaBurn a music festival? A: No. It’s an art event, created by a community of volunteers who actively participate. That said, the event features a wide range of music, though none is staged or scheduled in the commercial sense of a music festival. Performance is spontaneous and eclectic and frequently is designed to encourage participation. 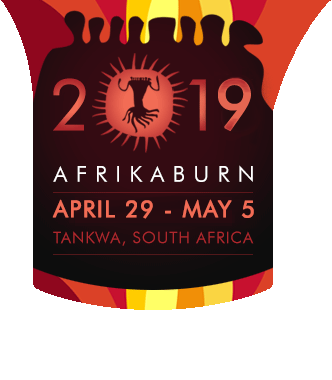 Q: Can I attend AfrikaBurn for one day? A: Whilst nobody would prevent anyone from coming for one day, it’s not really possible to experience, and participate in, AfrikaBurn in one day. Participants are encouraged to spend at least a few days during the event’s week-long duration.